All training courses take place in rooms at the Dryden Centre, Evistones Road, Low Fell, NE9 5UR. Training rooms for courses will be shown on the main screen when you walk into the reception area on the day of the course, and there is a map attached below that will tell you where the room is if you haven’t visited the Dryden Centre before.To book onto any training courses, please contact John Finch at JohnFinch@gateshead.gov.uk with the name of your school at which you are a governor, and the course(s) that you would like to book onto. 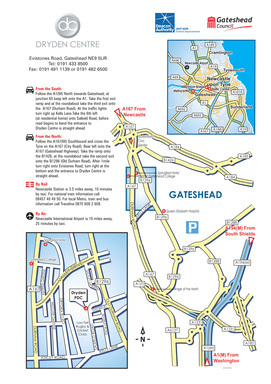 There is also a map below showing visitors how to get to the Dryden Centre.